The Eagles' Carole Miller gets to the rim for two of her 26 points after a feed from Charlotte Jewell. When the Edison girls are dominant, the box score can be something to behold. –On 25 made field goals on the night, Edison players registered assists on 22 of them. 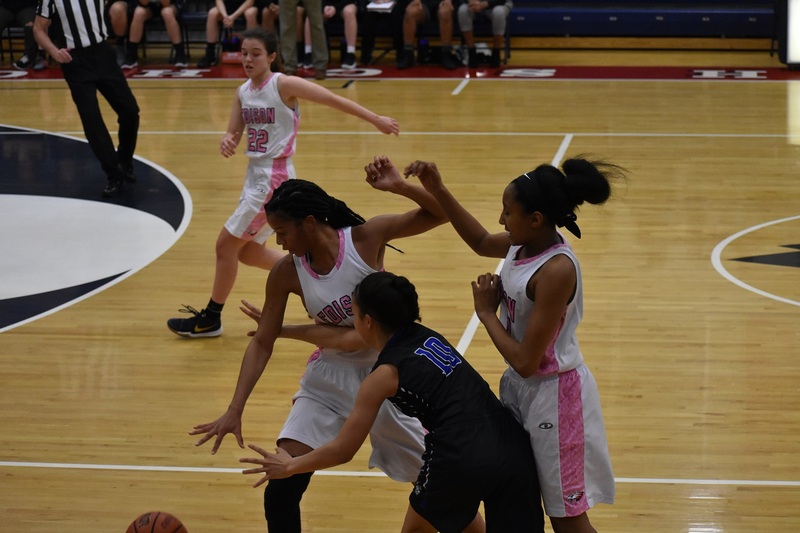 The Eagles didn’t let Tuscarora’s vaunted press bother them at all, with solid ball-handling and deft passes often producing lay-ups against the Huskies’ pressure. Nine players registered assists with seven Edison players getting at least two. –The Eagles’ defense shut down Tuscarora senior star Kennedy Middleton, who was averaging 20 points a game. Lengthy Eagles junior forward Carole Miller had a lot to do with that, playing solid defense on Middleton most of the night. But bizarrely, Middleton only took her second shot midway through the fourth quarter. She finished with seven points on three-for-three shooting, but for most of the game it seemed like she wasn’t even playing. –Conversely Miller, Edison’s star, was dominant. She scored 26 points and grabbed eight rebounds, getting to the line an astounding 11 times by the midway point of the second quarter and 17 times on the evening. Miller didn’t even play the last five minutes of the fourth quarter, making her stats all the more impressive. –The Eagles’ bench accounted for half of Edison’s points. Jaylah Evans had 14, Amaya Gray 12, and Bri Johns eight. 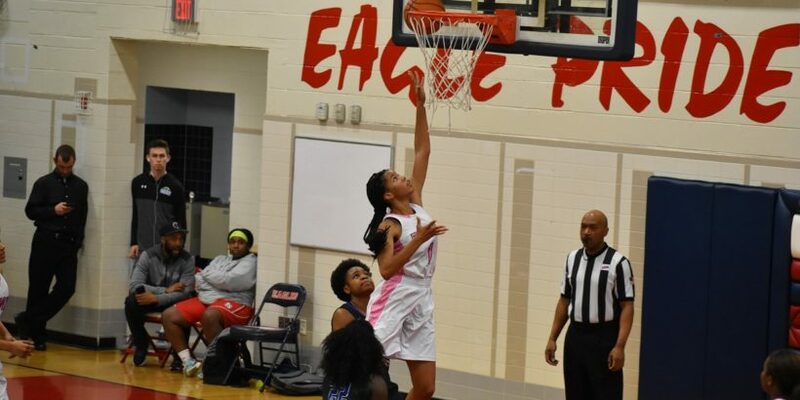 –The Eagles out-rebounded Tuscarora 40-19 with nine Eagles players getting at least two boards. The Eagles’ trap produces a turnover in the first quarter of Thursday’s victory. It was a complete and total team win. Edison led from almost the outset, but it was a close game at 19-16 a few minutes into the second quarter. At that point Edison’s defense stiffened. The Eagles held the Huskies to just four points the last half of the quarter, establishing a 34-20 halftime lead. They would never be seriously threatened again. Tuscarora, the Potomac District regular season co-champs, were led by junior guard Rosi Santos’ 15 points and six assists. Despite the loss against a tough opponent, the Huskies can be pleased with another fantastic season in which they finished 24-3. Edison (22-4) will play the team that defeated Tuscarora in the Potomac District Tournament, Freedom-South Riding, tonight for the Regional Championship.